A UCLA-led study has identified a protein that appears to play a key role in protecting people infected with Mycobacterium tuberculosis — the bacterium that causes tuberculosis — from developing the active form of the disease. 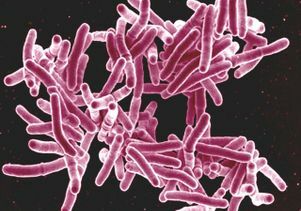 The protein, interleukin-32, was discovered to be one biomarker of adequate host defense against TB. The discovery could help doctors identify people who are at the greatest risk for the highly contagious and potentially fatal lung disease, and it could point the way toward new treatment strategies for TB. The study, conducted in partnership with researchers from Harvard University School of Public Health and the University of Michigan School of Medicine, was published in the Aug. 20 online edition of the journal Science Translational Medicine. The findings underscore the importance of maintaining sufficient levels of vitamin D to effectively combat the pathogen that causes TB. The researchers found that the protective protein, interleukin-32, can induce the killing of the TB bacterium only in the presence of sufficient levels of vitamin D.
An estimated one-third of the world’s population is infected with tuberculosis, but the disease is latent in 90 to 95 percent of infected people, meaning that they experience no symptoms and are not contagious. Interleukin-32 contributes to maintaining that latent state and preventing active infection. In 2012, nearly 9 million people worldwide became sick with TB and there were 1.3 million TB-related deaths, according to the U.S. Centers for Disease Control and Prevention. A new urgency for developing new approaches to identify individuals at risk, maintain immunity and treat active disease has arisen in recent years as TB has re-emerged as a global health threat — thanks in part to the rise of extremely drug-resistant bacteria. In people with active TB, the disease-causing bacteria have overcome the defenses of the immune system, causing symptoms to develop in the lungs. Previous studies have focused on finding biological markers of disease progression in those patients. The new study, however, was the first to look for markers of protection in the blood of people with latent TB — those who are infected but have not developed symptoms. The researchers analyzed gene expression profiles of hundreds of TB patients in four countries, as well as evaluating genes from activated immune cells shown in the laboratory to have the ability to kill the TB bacteria. They discovered that in people who were infected with TB but had higher levels of interleukin-32 (IL-32), the disease was more likely to be latent, and that — in laboratory experiments — IL-32 was able to stimulate the immune system to kill TB-causing bacteria, but only in the presence of sufficient vitamin D levels. Vitamin D is produced in the skin upon exposure to sunlight, but approximately one-third of American adults — particularly members of ethnic minorities with darker-pigmented skin and lighter-skinned people who receive minimal sun exposure — lack sufficient levels of vitamin D, and vitamin D deficiency has been found to be associated with a higher risk for active TB. Further studies are needed to determine if vitamin D supplementation helps prevent TB. But Modlin, a dermatologist, favors oral supplementation rather than increased sun exposure, which can increase the risk of skin cancer. Although TB remains a leading killer in many parts of the world, the incidence of the disease has been declining in the U.S. since a resurgence that peaked in 1992, according to the CDC. A total of 9,945 cases were reported in 2012, and 569 people died from the disease in 2010, the most recent years for which U.S. data are available. In the U.S., unlike in many poorer countries, patients known to have latent TB infections are typically treated with antibiotics to prevent progression to the active disease. But strains of the tuberculosis bacteria are becoming resistant to the antibiotic drugs, increasing the threat of a multidrug-resistant TB pandemic that could affect the U.S. The research builds on the team’s previous work that found that vitamin D is important for killing TB bacteria. Funding for the new study was provided by the National Institute of Allergy and Infectious Diseases of the National Institutes of Health. As a result of the study, Montoya, Modlin and Bloom have applied for a patent application for further development of IL-32 as a potential diagnostic marker to see which patients with latent TB are at risk for activation of the disease, as well as for use as a possible therapeutic to treat tuberculosis by stimulating antimicrobial activity. The patent is co-owned by the Regents of the University of California and the President and Trustees of Harvard College, and is managed by the UCLA Office of Intellectual Property and Industry Sponsored Research.